While no one deserves to die in a war, of the estimated 30,000 Libyans to die in the struggle to overthrow Mummar Qaddafi, no one else can be said to have had it coming more than Mummar Qaddafi. Not only did he rule for more than 40 years by using terror, he had tens of thousands murdered, he conducted his 10 month campaign to stay in power with the utmost brutality. Most of those 30,000 souls were Libyan civilians killed by Qaddafi with artillery, tanks, snipers and cluster bombs. He targeted civilian to the end and so made the UN mission to protect them synonymous with ending his rule. So I find it odd that many on the left single out the killing of Mummar Qaddafi to demand investigation and justice for. During the ten month revolutionary struggle the goal of the vast majority of Libyans was to overthrow Qaddafi but the cynical left developed its own narrative for what they referred to as regime change. A regime change they opposed. They fought to extend Qaddafi’s rule just as they fight to extend Assad’s rule today. They had no opinion on the struggle in Libya until NATO got involved, then “as they saw it” it was just another “War for Oil”, just another Iraq. As spectators to history, they declared “we’ve been through this movie before.” Usually that meant the rebels and the NTC where seen as agents of imperialism, and the depth and breath of the Libyan opposition was denied. This was all done in the name of “opposing our own bourgeois” but its central foundation has been a cynical appreciation of the revolutionary movement of the Libyan people. A year ago, this whole crowd was sure that NATO intervention would lead to a NATO occupation of Libya ‘ala Iraq or Afghanistan. Clearly that hasn’t happened. Those that predicted such NATO “boots on the ground”, and that’s what they meant at the time, where wrong. That did not happen. That is just one thing, on top of many, many things they got wrong about the Libyan Revolution, but rather that admit they were wrong about that and maybe some other things and being so bold as to make a reappraisal of their views on Libya, they cling to those views. They welcome any bad news from Libya and use it to support their view that the revolution in Libya is a bad thing and shouldn’t have happened. They find themselves quoting favorably from the MSM that has it’s own reasons for pouring cold water on post-Qaddafi Libya. They take every outbreak of violence and every injustice still happening in revolutionary Libya, blow it all out of proportion, and talk of “chaos” in Libya. Over 2.7 million people have registered all over Libya for national elections on June 19th or early July [there is talk of a short delay as I write this] Misrata and Benghazi already had local elections. Libyans all over the world are registering at their still functioning embassies and all these people can talk about is “no functioning government” in Libya. 1.) Why are there no NATO bases in Libya? 2.) Why are there no NATO troops in Libya? 3.) Why did they refuse to turn over the ‘so-called’ Lockerbee Bomber as demanded by the West? 4.) Why did they stop and expose the CIA’s special rendition program in Libya? 5.) Why is the revolutionary commander of Tripoli Head of the Military Council of Tripoli, Abdel Hakim Belhaj suing former British FM Jack Straw? During the Libyan Revolution, the pro-Qaddafi forces, with help from Russia and Iran, developed this fantastic network of Internet websites and blogs that spread Qaddafi’s war stories far and wide so that they would be replicated so many times that they would be the first thing found by the search engines. Now that the real facts of the situation in Libya last year are coming to light we are in a position to compare the Qaddafi lies, and those of his parrots with the reality on the ground. Let’s take just one example – the NATO March 19 bombing of Libya. From the AJE tapes released last month of phone calls between Qaddafi and his cronies we have this. A crowd of hundreds, many wearing green to show their support for Muammar Gaddafi, gathered in Tripoli on March 20 for a mass funeral. They were burying dozens of civilians – some of them children – killed overnight in NATO airstrikes. El Safi and his aides moved ahead with the plan, but they encountered a problem: The cemetery they planned to use couldn’t accommodate the huge number of “martyrs” the government planned to bury. El Safi: Okay, move them to Al Hansheer [cemetery]. Get ready, I’ll tell you now. The objective is not to come to the rescue of civilians. Quite the opposite. Both military as well as civilian targets have been pre-selected. Civilian casualties are intentional. They are not the result of “collateral damage”. Early reports confirm that hospitals, civilian airports and government buildings have been bombed. Within hours of the air attacks, a Libyan government health official “said the death toll from the Western air strikes had risen to 64 on Sunday after some of the wounded died.” The number of wounded was of the order of 150. (Montreal Gazette, Gadhafi hurls defiance as allied forces strike Libya, March 19, 2011). These deaths resulting from US-NATO missiles and aerial bombings are either denied or casually dismissed as `collateral damage`. On March 20, thousands demonstrated in Los Angeles to say no to war and occupation in Iraq and Afghanistan. The demonstration was called by the Answer Coalition. 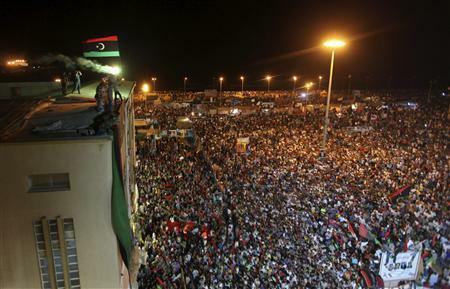 Libya was clearly on the minds of everyone there and news of the criminal attack electrified the demonstration. The announcement of yet another imperialist war was booed and jeered as the words crawled across an electronic sign on CNN’s L.A. office. The International Action Center distributed a statement denouncing the attack on Libya. The next day the IAC held an emergency demonstration at the Westwood Federal Building to demand an end to U.S., French and British bombing of Libya. Members of BAYAN-USA, the All African Peoples Revolutionary Party — GC, Unión del Barrio and Anti-Racist Action also participated. The action was covered by ABC, Fox, Telemundo and Univisión. Now they are organizing protests against US intervention in Syria. I received a call just yesterday from the IAC calling on me to support Assad at their up coming pro-Assad Rally – No US/NATO War Against the Syrian People! Apparently the war that the Assad regime is currently waging against the Syrian people is not to be protested, only an extremely unlikely one by the US and NATO. Assad is current slaughtering thousands of Syrians so naturally they are opposed to “regime change” just as they were when Qaddafi was killing Libyans. They wish he was still at it. The US Embassy in a single line statement this morning reiterated the Maltese government’s statement categorically denying claims that there are US troops in Malta. The government’s statement was issued two days ago after former US Congresswoman Cynthia McKinney said in a blog that “12,000 U.S. troops (are) stationed in Malta and they are about to make their descent into Libya”. As a resident of Malta, I can guarantee her – and you – that this is untrue. There are no 12,000 US soldiers stationed on Malta. And trust me, this island is so small, I would have seen them. There isn’t enough space for 12,000 troops to hide, especially not if they have the typical soldiers’ equipment of tanks, artillery, helicopters et cetera with them. – To put things into perspective: the whole military of Malta is 2,140 troops strong. Even at the height of World War II, when Malta was hotly fought over as the central location in the Mediterranean, no more than 26,000 troops stationed on Malta. Its been six months since Cynthia McKinney made her prediction and we are still waiting for those US troops to make themselves known.